Limit 4 per person. Not valid before 10:30AM on weekends and course holidays. Not valid for 5-10-25 time pass holders. Not valid for leagues, outings, cash back or with any other offer. Voucher good for 15% off restaurant bill. Expires 7/1/2019. Featuring four tee box locations to offer a challenging yet enjoyable experience to golfers of all skill levels. Much like that famous line in Clint Eastwood’s Dirty Harry, the first thing you should ask yourself when teeing up on Blue Shamrock is if you feel lucky. Well, do ya, punk? If you do, you might want to try taking on this beautiful course from the championship tees – a true challenge even for the most skilled player. 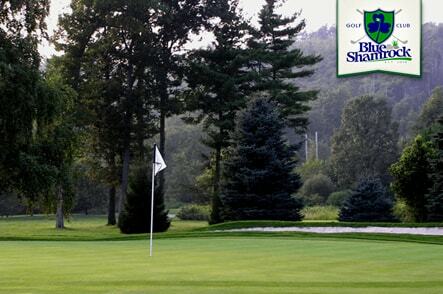 Extending the length of the course to 6,600 yards, the back tees at Blue Shamrock work in more challenge and expose you to more hazards than any of the others – so choose wisely!. If you don’t feel quite so lucky, an especially smart choice for first-time visitors, the course’s four tee box options all perfectly combine playability and challenge for a playing experience you won’t forget. Set among the gorgeous undulation of the tree-lined Pennsylvania countryside, the course’s biggest challenge comes from a variety of foliage, trees, and water all fairly consistently in play. Your best ally in the fight against a three-digit score is proper course management – a must at Blue Shamrock if you’d like to shoot a low score. Learn early to navigate the deceptively speedy greens and stay away from the deep white sand bunkers, and you’ll most likely walk away with a score you’ll be proud to share. No matter how many rounds you’ve played this year, some time at the practice range is always valuable. Thankfully, Blue Shamrock offers one of the finest practice facilities in town including a full-length driving range, sand bunker, chipping area, and putting green. The Pro Shop is exceptionally stocked with merch and accessories from the brands you love, and your post-round toasts will feel right at home at the delicious Sunset Ridge Restaurant and Pub. The facility is also an ideal host for outings and parties of all types and sizes. Reserve the highlight round of your year now with today’s feature!